Photo, models, & layout by Woody Langley. Used with permission. 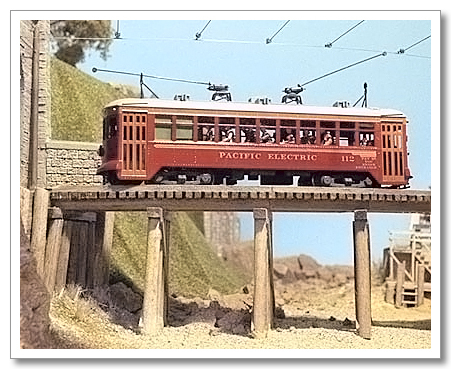 Foothill Model Works’ goal in producing Pacific Electric decal sets was to make them as accurate as possible. At first there were more questions than answers. A lot of what was written about colors and lettering was vague or conflicting, and we found out quickly that memories can be faulty. To insure accuracy, we decided that we wouldn’t rely on any information that couldn’t be backed up with photographs or actual P.E. documents. There are still some unanswered questions. If you have photos or documents that show lettering variations we don’t produce, we’d like to hear from you. Many people helped us along the way. A very special thanks goes to Bill Everett, Woody Langley, Ruben Madrid, Bob McVay, Don Olson, Fred Ramm and Ed Suydam. Silver lettering was used on all passenger cars after the 1942 modernization program began. Both wood and steel cars received silver lettering. It is not known how long it took to complete the project, but here are some samples from the I.N.L.- The Early Interurban Newsletters. “:April 1943: The 5000’s have been seen with the new gray roofs instead of the original aluminum; 1100’s are showing up in red-orange paint. October 1943: Black with white stripes on each end is now standard paint scheme for all P.E. freight motors. (This may have been the standard, but I have pictures showing red steeple cabs working with black and orange steeple cabs. JK). November 1943: 1370 and 1372 combines were repainted. March 1944: 1241 class trailers are now being repainted as they are in for overhaul.” You can see from this short listing that it must have taken a long time to repaint the whole fleet. If you are modeling the early to middle forties you can mix Dulux™ Gold lettering with silver lettered cars in the same train. Steel cars also received their “wings” and orange letter boards at this time. Combines (except 498 and 499) and wood cars did not receive wings or orange paint. The supply of tan paint was limited due to the war effort, so the P.E. obtained Battleship Gray paint for the roofs of some of the cars. Headlights, retrievers, buffers, pole bases, hold downs, pilots, trucks and underframes were black. The trucks of the steel cars were painted Pullman Green or Army Olive Drab after 1942. Bill Everett and Don Olson have come up with photos showing very dark green trucks on steel cars. Car number 1299 had coach green trucks and white walls, but, as far as we know, this is the only steel car painted this way. Combo 1370 had whitewalls in 1915. Car number 1214 had whitewalls about the same time. In the early 1900’s many cars probably had whitewalls and Gold Leaf lettering. Also 1252 through 1257 had whitewalls in Parlor car service. Dulux™ Gold lettering was used on all passenger equipment from the early 1920’s until the 1942 modernization program. Wood cars were lettered in Southern Pacific Railroad Roman, centered on the car sides below the windows. Steel cars (except 1100’s) had extended Railroad Roman lettering centered above the car windows. The roof color when P.E. first started using Dulux™ Gold paint was dark gray and later was changed to a lighter gray. Headlights, retrievers, buffers, poles, pole bases, hold downs, pilots, trucks, underframes and the steps on wooden cars were black. White lettering was used on Box Motors, RPO’s, Suburban locomotives, steeple cab locomotives, and work equipment after about 1927. Prior to that, the lettering was Dulux™ Gold on Box Motors and RPO’s. We have been told that some of these cars had Dulux™ Gold lettering until circa 1940, but we can’t find any proof of this. If you have any information that would help us establish this, please let us know. The Box Motors and RPO’s were P.E. Red. Steeple cab locomotives were painted P.E. Red, then in the mid forties changed to black with white striping and lettering. Suburban locos and work equipment were painted box car red (including the roofs). Handrails, grab irons, headlights, retrievers, buffers, poles, pole bases, hold downs, pilots, trucks and underframes were black. A few cars had white handrails. After looking at literally thousands of slides and prints, we find nothing to indicate that any of these classes were ever lettered in Silver. Another interesting note: The steeple cab locomotive #1544 at Travel Town, in Griffith Park, Los Angeles, was never painted P.E. red while it was in service. It was box car red. We have found that the following paint colors come very close to matching the colors used by the P.E. The colors have been selected by their availability at hobby shops. (Note: The paint colors listed here pre-date the government’s water based paint mandates. We are looking into the new paints and will update this page when we find matches in the water based colors.) Also, consideration has been given to how the colors look in indoor lighting.